Every day I meet people who know exactly what they want in life, but no matter what they do they just can’t seem to get there. Every year they make resolutions or determine to change something for the better. They are going to get healthy, get a promotion, get out of debt, start a business, write a book, travel more, meet the man of their dreams, be a better friend or give up some awful habit. The list is as long as the ocean is wide. When there is a gap between where you are and where you intend to be it can feel rather disheartening to blindly go through the process of change. We often naively start out thinking that we can just snap our fingers and that change will happen, or feel so overwhelmed by the idea that we don’t even start. We are challenged as our will and our power are pressed against the wall as we consciously try to control the outcome of our lives. Most people are completely unaware that there are simple yet effective steps that you can take to literally change your mind. Life can be busy, and when you are the type of person who thrives on being productive the last thing you want to do is spend time wading through an ocean of suggestions that have a very short shelf life. So what is the answer to setting goals and achieving them? Congruence. When there is harmony between what you think, what you feel, what you say and what you do, you have congruence, and in this state the mind can be changed to set the goals you want and then successfully achieve them. A simple Life Therapy technique I developed draws upon Journaling to chart new courses towards the destination you want to reach by engaging your subconscious mind to create congruence, harmony. The human baby is born with only two fears, the fear of falling and the fear of loud noises. If you drop a baby, even if it is just a small drop of a couple of inches, or if you make a loud noise close to a baby’s ear, the baby will start to cry, a rather visceral cry at that, eyes clamped shut, mouth open, all an expression of fear. Yet, you can take that same baby and place it in deep water or in a company of wolves and the baby will show no signs of fear or distress. Why? Because the baby has no context to which it can evaluate these experiences. The context comes later, such that everything beyond the two basic fears – good or bad – true or false – is learned. And everything we learn is being subconsciously conditioned and programmed. It is as if our minds are sponges, soaking up impressions without the benefit of mature logic and reasoning. This is how our life story is written. The Life Therapy approach to Journaling is a way of rewriting the subconscious roadmap of your mind. In the process of rewriting your life story, the self-limiting negative beliefs we learn as children can be altered. Because the process is incremental in gain you only need to start by addressing one small change to experience a domino affect in all areas of your life. Pay attention to the small things and the big things will take care of themselves. 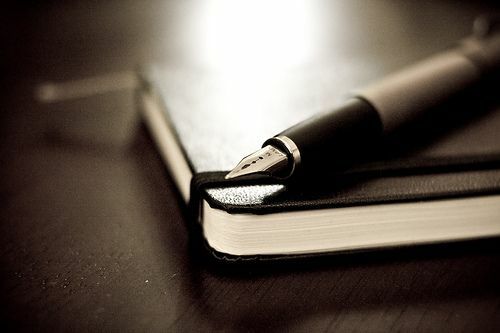 To change a habit that will change your life, start with the small yet potent habit of writing in a journal each night. Most people use journaling to write the story of their day to day experience of life. I suggest you use journaling in a more effective way, to rewrite the story of your life. Once people really understand how journaling can be used they never want to miss a day of journaling again. Every night before you go to sleep make a request to your subconscious mind. Here are the simple steps to Life Therapy Journaling. Before you go to sleep take 10 minutes to plan and write down your goals. Write in cursive using a pen. Use present tense or near future. Take time to visualise the desired goal or outcome and then write it in as much detail as possible. Pay attention to how you feel as you write your goals. Feeling a sense of wellbeing as you do the exercise is more likely to create a good outcome. Get into the detail. Ask yourself questions related to the goal or outcome you want to achieve. Clarity of intention will make it easier for your subconscious to create a good outcome that suits your needs. As you go to sleep your subconscious mind will go to work on creating the steps you will take in each moment of your life to achieve your desired outcomes and successfully accomplish your goal. Remember, learning any new skill in life requires practise, the more you practise the better you will get. It can take just 1 day to notice a change, 21 days to notice significant improvement and up to 40 days for what I call the really great goals to present themselves. The only time this exercise will not work is when you don’t do it. Have fun with the process and enjoy the ride! Simple exercises like this one can open us up to things we may have kept hidden in the back of our mind. If you would like support then get in touch. You can book a session and leap forward with your goal setting in a 1-2-1 Coaching and Hypnotherapy session.